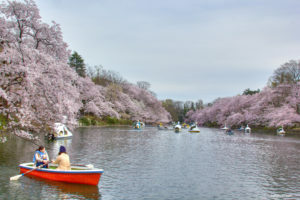 Inokashira Park (井の頭恩賜公園) has a large pond which is one of the favorite sakura spot in Tokyo with its 250 cherry trees lining up its banks. 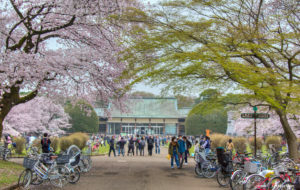 Koganei Park (小金井公園) has about 1,700 cherry trees and it is considered as one of the best 100 Sakura Spots in Japan. 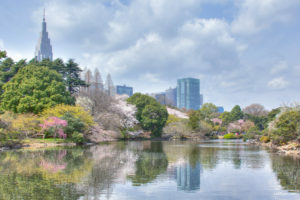 Hibiya Park (日比谷公園) is a 16 hectares park that sits in front of the Imperial Palace. 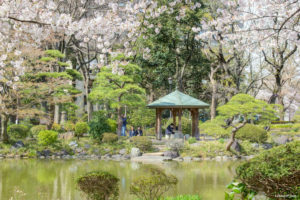 Its location makes it a good hanami spot for employees working nearby who wish to go for a quick hanami lunch break..
A 43-hectares park located on the western side of Tokyo. A large pond lined with cherry trees on its banks creates a stunning view during the sakura season.